A protected area since 1999, Kwandwe Private Game Reserve incorporates several former farms, for which past records of bird occurrences are available. No bird species appear to have been lost from the area. Between 2001 and 2005, a group of observers conducted systematic bird surveys in most months, which allowed the status (resident, migrant or irregular visitor) of most bird species to be determined. At least three species have established breeding populations in the reserve over the past 10 years. Of 302 species reliably recorded to date, 182 (60.3%) appear to be resident, 46 (15.2%) are seasonal migrants and 74 (24.5%) are vagrant visitors. Eight vulnerable and eight near-threatened bird species have been recorded; Blue Crane, Kori Bustard and African Crowned Eagle have bred in the reserve. Together with other state-owned and private protected areas in this region, this reserve holds a significant portion of the inland bird species recorded from the Eastern Cape. CONSERVATION IMPLICATIONS: The varied thicket vegetation types of the Great Fish River Valley support a considerable diversity of bird species. If these habitats are managed for biodiversity conservation, they can support a large component of the terrestrial avifauna of the Eastern Cape region. Over the past 20 years there has been a significant shift in land usage in the Eastern Cape. Several commercial farms have been converted to game ranches either for hunting or for ecotourism (Palmer 2008), leading to the formation of extensive private reserves along with the expansion of state-owned conservation areas such as the Addo Elephant National Park. This has particularly affected the vegetation type originally described as Valley Bushveld by Acocks (1975), and now treated as a distinct biome, Albany Thicket, by Mucina and Rutherford (2006). In this paper, we present some baseline data to establish how this management change has influenced the avifauna in one protected area in the Eastern Cape. Kwandwe Private Game Reserve (PGR) was established in 1999 and the first lodges opened for guests in 2001. There are bird records from different sources for three distinct periods: museum specimens (1916-1960), bird club observations (1980-1999), and surveys by reserve staff and associates (2001-2005). The present study investigated four questions. 1. What bird species occurred in the area prior to the establishment of the reserve? 2. Have any species been lost since then and, if so, can we explain their disappearance? 3. Have new species become established and, if so, can we account for their arrival? 4. Do periodic vehicle-based surveys reflect the current species diversity? Kwandwe PGR (33º09'S, 26º37'E ) lies in the Great Fish River Valley, approximately 35 km north of Grahamstown in the Eastern Cape, South Africa. The farms purchased for the reserve had previously been used primarily for stock farming, with irrigated lands bordering on the Great Fish River and ostrich pens on some sections. In 2005 additional land was purchased on the northern bank of the Great Fish River, increasing the area of the reserve to some 20 000 ha. The perennial Great Fish River flows through the reserve for about 25 km and all watercourses drain towards the river (Figure 1). The main vegetation types represented in the reserve are Great Fish Noorsveld and Great Fish Thicket, within the Albany Thicket Biome. The Kwandwe PGR preserves a significant area of Great Fish Noorsveld (Mucina & Rutherford 2006). At a finer scale, Bissett (2007) described 11 vegetation types in the reserve, of which five cover more than 1000 ha. These form a mosaic of thicket and bush-clump types, with Acacia karoo, Cussonia spicata, Euclea undulata, Euphorbia spp., Maytenus spp., Pappea capensis, Portulacaria afra, Searsia spp. and Schotia afra as the dominant larger plant species. There are also old cultivated lands, now covered by grasses, and two large dams. Recent additions to the property include some valleys with Dry Forest, including species typical of both Valley Thicket and Afro-montane Forest (Mucina & Rutherford 2006), on the north bank of the Great Fish River, where large trees such as Harpephyllum caffrum occur. The altitude ranges from 170 m a.s.l in the Great Fish River Valley to 600 m a.s.l. on the ridges, and mean annual rainfall for the past 7 years was 394 mm and 358 mm at Brandeston and Krantzdrift, respectively (Bissett 2007). Past records examined in this study included the published literature on birds of the Eastern Cape, the bird collection at the Albany Museum, records of outings by the Diaz Cross Bird Club, and an unpublished list of birds on the farm Brandeston, compiled by C.A. Whittington-Jones. During 2001 the staff at Kwandwe PGR began a systematic survey conducted on a specific day each month for the 'Birds in Reserves Project' (BIRP), coordinated by the (then) Avian Demography Unit at the University of Cape Town. BIRP records exist for five months in 2001, for every month in 2002, for eight months in both 2003 and 2004, and for all months in 2005. These records allowed for an assessment of the birds that are likely to be resident as opposed to vagrants. We have also included more recent records (up to October 2009). During the BIRP surveys we followed a standard route, with surveying starting at 06:00 in summer and at 07:00 in winter. The route was designed to traverse all the different vegetation types in the reserve and to pass close by the major water bodies. The total distance was about 35 km, which was covered in 8-10 hours. We also included other sightings by rangers during the observation period; these reports typically included only large birds such as bustards and cranes, or birds of prey. Between three and eight observers participated in the surveys, depending on staff commitments on the particular day. Normally an open game-viewing vehicle was used; if another vehicle was used, there was always one observer standing on the back. All observers were experienced bird watchers equipped with binoculars and all species confirmed by call were included. The bird names used follow those in Roberts Birds of Southern Africa (eds. Hockey, Dean & Ryan 2005). Only standard English names are used in the text, but both English and scientific names are given in Online Appendix 1. Specimens from the Albany Museum included 68 study skins from the present reserve area (collected on the farms Brandeston and The Fort, which both had river frontage). All but three specimens were collected between 1920 and 1927: a Long-billed Crombec collected on Brandeston in 1916, a Dark-capped Bulbul from The Fort collected in 1939, and a Crowned Hornbill from Brandeston collected in 1960. The collections were made by V.E. Watson on The Fort and A.T. Rivett-Carnac on Brandeston. Hewitt (1931) cited Rivett-Carnac as one of his bird informants and mentioned a single sighting of a White-fronted Bee-eater from the Great Fish River Valley, but gave no precise locality. Despite this being a biased sample in which larger birds such as waterbirds, gamebirds and raptors are poorly represented, it does provide insight into the avifauna history of the area. Of the 56 species, 55 have been recorded on the reserve in the past 5 years. The only exception is the Red-headed Finch, which was categorised as 'locally nomadic' by Dean (1997) and makes occasional incursions into this region according to recent records from Brandeston. Seven sets of eggs collected at Heatherton Towers (now the visitor reception centre on Kwandwe PGR) in the 1930s, also formed part of the past records. The eggs represent species that currently breed on Kwandwe PGR. They are listed together with the study skins in the category 'Museum' in Online Appendix 1. C.J. Skead visited all the farms that have now been incorporated into Kwandwe PGR during his research on Eastern Cape birds, but no specific records are mentioned in his reviews (Skead 1965, 1967). The Diaz Cross Bird Club visited the farms Brandeston, Krantzdrift and The Fort (now incorporated into Kwandwe PGR) on four occasions between 1980 and 1998, during which 117 bird species were recorded within the area of the present reserve. Three of these species (Glossy Ibis, Southern Pochard and Cape Canary) have not yet been recorded since the establishment of the reserve. Club members also submitted sightings of interest to the club newsletter and we have extracted from the 'Diaz Diary' all such reports (listed under 'Diaz' in Online Appendix 1). One species, the European Bee-eater, was reported in March 1988 but has not been recorded from the area since. There are unconfirmed records for Denham's Bustard (formerly often confused with Ludwig's Bustard - see Herholdt 1988), Sand Martin (likely erroroneous identification for the Brown-throated Martin, formerly the African Sand Martin), Yellow Wagtail, and Thick-billed Weaver (the latter both from an unreliable observer). From July 1997 to June 1999, C.A. Whittington-Jones made regular visits to Brandeston during his study of Red-billed Queleas at ostrich feedlots. He recorded 136 bird species on the farm, of which only the Red-headed Finch (sighted in May 1998 and May 1999) has not subsequently been recorded on the reserve. Since the removal of the ostrich feedlots, the Red-billed Quelea has become an occasional vagrant in the area. To date, 302 bird species have been recorded reliably on Kwandwe PGR (Online Appendix 1). Of this total, 274 species were recorded during the 45 BIRP surveys included in this overview, representing more than 90% of the species recorded up to 2006. The avifauna was subdivided into broad habitat classes within which the birds could be categorised as regulars, vagrants or migrants based on the monthly distribution of records (Table 1). Compared with three other Eastern Cape conservation areas where Thicket is the predominant vegetation type, Kwandwe PGR has the most diverse avifauna (302 species), of which 11% have been recorded only on this reserve. Some 194 species have been recorded from the original Addo Elephant National Park area of 12 000 ha (Urquhart & Klages 1997), excluding the recently added Colchester, Zuurberg and the Greater Addo sections towards the coast. These include habitat types such as Southern Coastal Forest, Suurberg Quartzite and Suurberg Shale Fynbos (Mucina & Rutherford 2006), which are absent from the other reserves. The checklist for the Great Fish River Reserve complex records 245 species from the area west of the Great Fish River, which spans the former Andries Vosloo Kudu Reserve and the Sam Knott Nature Reserve (23 000 ha combined). Shamwari Game Reserve currently covers 22 000 ha, with 257 species having been recorded. Although Addo Elephant National Park is thus the smallest of these conservation areas and no river runs through the reserve, all four reserves lie below the inland escarpment and at a similar distance from the coast. The Great Fish River Reserve is almost adjacent to Kwandwe PGR and Shamwari Game Reserve is less than 20 km from Addo Elephant National Park in direct line of flight. These reserves form part of a belt of conservation areas between the coast and the more arid interior and include a significant proportion of the South African avifauna (combined total = 334 species), despite none being mentioned in the first national survey of important bird areas (ed. Barnes 1998). Several species have been recorded only once. However, in all cases there are other records for single sightings in adjoining regions of the Eastern Cape and in some instances the timing of vagrant sightings suggests that the same individual birds could have been observed. This group includes the African Pygmy Goose, Ground Woodpecker, African Black Oystercatcher (sighted after a period of onshore gales along the coast), Caspian Tern, Tawny Eagle, Bateleur, Baillon's Crake, Greater Flamingo, Abdim's Stork, Dusky Lark, Chat Flycatcher, Chorister Robin-Chat, Capped Wheatear, White-browed Sparrow-weaver and Long-tailed Paradise Whydah. The Goliath Heron, a rarity in the Eastern Cape in the 1980s, is now well established along coastal rivers, down the east coast (Craig 2006) and on inland dams, perhaps spreading from major impoundments along the Orange River. Kurrichane Buttonquails were not reported from the Eastern Cape during the bird atlas survey (Harrison et al. 1997), although there are historic records (Skead 1967). Several recent records at different times of the year have led to suggestions of a range expansion into the Eastern Cape (eds. Hockey et al. 2005). Birds on Kwandwe PGR were most often flushed from areas of thicket-grass patch habitat mosaic. In 2001 an adult bird was seen with a single, very small chick, indicating that breeding had occurred. The White-fronted Bee-eater was previously regarded as a vagrant in the Eastern Cape (Harrison et al. 1997; Skead 1967). A pair was found breeding on the Sundays River at Colchester in 1998 (Martin 1999) and since then birds have been seen at this site annually. Found nesting on Kwandwe PGR in January 2002, the birds were initially thought to be summer-breeding visitors, but in recent years they have been sighted in most months and may now be considered resident. African Palm Swifts were not recorded south of KwaZulu-Natal by Skead (1967) nor Quickelberge (1989), who reviewed data for the Transkei region. 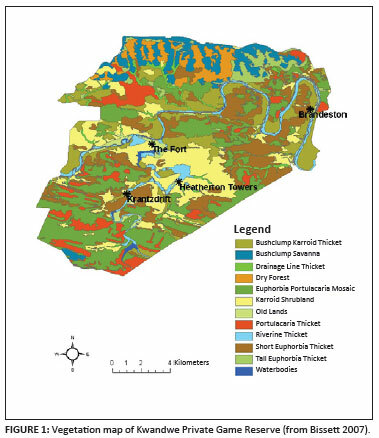 Nevertheless, the first records for the Eastern Cape date back to the 1980s in Steytlerville (Ward et al. 1984). This species is now regular along the coast where suitable palms are available and has also been recorded in Grahamstown. A small colony has been present on Kwandwe PGR at the Brandeston homestead since 2005. The Double-banded Courser was not found in the Grahamstown region during the bird atlas surveys (Harrison et al. 1997), which supports Vernon's (1982) observation that coursers are rarely sighted in the Eastern Cape today. However, this courser has been sighted in one section of the Kwandwe reserve quite regularly, in association with other birds typical of the arid interior (e.g. the Rufous-eared Warbler). Breeding had been recorded in 2001 and 2002. The Violet-backed Starling is an intra-African migrant, which has been recorded breeding in the Eastern Cape to the east of the Great Fish River. In recent summers there have been an increasing number of reports from this southern extremity of its range in South Africa. The Scaly-feathered Finch was first reported in 2006 and is now apparently a breeding resident, but its distribution is very localised within the reserve. To date there has been a single sight record of the White-browed Sparrow-weaver, but nesting birds were found on a farm south-west of Kwandwe PGR recently. This species has become established on farms in the Queenstown district in the past 20 years and is currently expanding its range there (K. Webster, pers. comm., May 2010). It colonised the Mountain Zebra National Park from the late 1960s onwards (Craig, Hulley & Parker 2005; Skead 1966). Passing largely unnoticed, the Southern Grey-headed Sparrow underwent a major range expansion during the last century, colonising the Albany district during the 1960s (Craig, Every & Summers-Smith 1987) and reaching the south-western Cape by the 1990s (Harrison et al. 1997). Barratt's Warbler, a bird from the mountain forests of the Eastern Cape often moves to lower altitudes in winter (Vernon 1989). This is reflected by higher winter records on the coast and occasional sightings en route (Craig 1986). The warbler was present in thick cover close to a game-viewing hide for several weeks in June 2003; it can easily be overlooked in areas traversed only by vehicles. A winter record of Chorister Robin-Chat may also represent an individual moving from montane forest towards the coast. The Dusky Sunbird is evidently a winter visitor to the Great Fish River Valley, with several sightings on the reserve where it often feeds on the honey thorn (Lycium oxycarpum). There were also ringing records from Brandeston and Resolution farms in the Fort Brown area prior to the establishment of the reserve and later captures at aloes on Kwandwe PGR and Hounslow, a farm on the western border of the reserve. Along with other reserves, Kwandwe PGR has been stocked with fauna which formerly occurred in the area (Skead 1987) and, more controversially, with species such as giraffe (Giraffa camelopardalis), which can be considered alien to the Eastern Cape (Castley, Boshoff & Kerley 2001). By contrast, only two bird species have been considered for re-introduction. The Red-billed Oxpecker, which had been locally extinct, was re-introduced to the Eastern Cape from the Kruger National Park in 1990, with birds released in Addo Elephant National Park, the Great Fish River Reserve and on a private game farm in the Highlands area (Craig & Weaver 1990). Birds have subsequently also been introduced to Shamwari Game Reserve in 1998 and there was a second release in the Great Fish River Reserve in 2003. Breeding has been reported from Addo Elephant National Park, the Great Fish River Reserve and Shamwari Game Reserve, with regular sightings from properties adjoining these sites. The birds are often seen on giraffe, one of their favourite hosts throughout southern Africa. Currently oxpeckers are recorded in Kwandwe PGR most months and over the past 2 years there have been sightings of dark-billed juvenile birds, despite no direct evidence of breeding within the reserve. The Southern Ground Hornbill may be introduced to Kwandwe in the future if the pilot project at Shamwari Game Reserve proves successful, although this region clearly represents the edge of the natural range of this species (Hulley & Craig 2007). 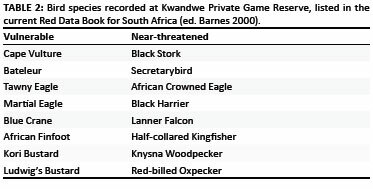 The avifauna of Kwandwe PGR includes 16 species of conservation concern, all of which are potential breeding species in the area (Table 2). The Cape Vulture has suffered a major decline throughout the Eastern Cape, with many former breeding sites now abandoned (Boshoff, Piper & Michael 2009). Only occasional vagrants are now reported in this part of the province. Similarly, the Tawny Eagle was formerly widespread in the Eastern Cape and until 1981 a regular breeding species. It is suspected to have suffered heavily from indiscriminate use of poisoned baits (ed. Barnes 2000). The sighting in January 2005 was the first in the Grahamstown district for some 15 years (Craig 2005). Bateleurs have seldom been seen south of the Orange River over the past 50 years and a record of an adult bird at Kwandwe PGR in June 2009 was a major surprise. African Crowned Eagles nest on the reserve and Martial Eagles still nest in the district. Blue Cranes nest on the reserve annually, while Kori Bustards have nested here occasionally. These ground-nesting species are, however, vulnerable to predators, particularly the black-backed jackal (Canis mesomelas). Cranes and bustards frequently collide with power lines (Jenkins, Smallie & Diamond 2010) and it is thus laudable that all power cables on this reserve are now underground. The Great Fish River Valley appears to form a conduit both for southward penetration of species typical of the arid interior, such as the Red-billed Firefinch, and for inland movements of species generally restricted to the coastal belt, such as the Yellow Weaver (recorded in the Great Fish River Reserve, but not yet on Kwandwe PGR). The thickets also provide acceptable habitat for some forest species such as the Narina Trogon and the Dark-backed Weaver. Conservation of the thicket biome is currently considered a priority, since this habitat has been extensively modified by agriculture and is regarded as important in carbon sequestration. Thus, the mosaic of privately managed and state-owned reserves in this region of the Eastern Cape should be seen as a significant contributor to conserving South African biodiversity. Although we lack a comprehensive checklist for the region prior to the establishment of the reserve, there is no clear evidence that formerly resident bird species have been lost, while at least three species (White-fronted Bee-eater, African Palm Swift and Scaly-feathered Finch) have established breeding populations since the area had become fully protected. Regular vehicle-based surveys by experienced observers seem to record a high proportion of the bird species that occur within the reserve. Such monitoring should form a part of future management plans, in the interest of both conserving biodiversity and highlighting additional attractions for visiting tourists. We are most grateful to the management of Kwandwe PGR, in particular Angus Sholto-Douglas, for supporting this project and placing vehicles at our disposal. Our thanks also go to all the rangers, trainees, and other volunteers who have taken part in the surveys. Brad Fike (Great Fish River Reserve) and Antony Collett (Shamwari Game Reserve) kindly provided copies of unpublished checklists of the birds of these reserves, and Craig Whittington-Jones offered us all his dated records for Brandeston. A.C. and P.H. received research funding from Rhodes University. C.B. received funding for research on carnivores from Kwandwe PGR during the time of the study.